Hi Cecilia, thank you so much for such a beautiful note and compliment. It means a lot to think that a piece of my work would touch someone so deeply ~ thank you for sharing your thoughts with me. From the photographs I’ve seen of New Zealand, it truly is a place of magnificent views, I can understand why you would miss it so. Thank you Andrew for your beautiful comment – I really appreciate that you took the time to visit my galleries. I have not painted with watercolors Andrew and I find your lessons from the Masters really intriguing. Maybe someday – for now I’m still finding my way with the OPs. Thank you so much ~ I love your discipline. It’s breathtaking gallery! I’m impressed… Congratulations and plaudits for you, Mary! Thank you so much Ana for taking the time to visit my blog and seascape gallery – means a lot to receive your feedback. I’m a big fan of your work – the vibrant and expressive feel to each piece is exciting to see. These are beautiful! I love water…I’m hoping to dig in deep into studying water soon…Thanks for the beautiful inspiration! Thank you for your lovely feedback on the paintings, water is a great subject to paint. Best wishes as you venture into water scenes ~ seascapes are an exciting theme to paint. Thank you for your generous comment Moorezart!! I love the sea. You capture so well its beauty in your paintings. It is amazing! Thank you for your wonderful comment and thoughts on this collection of seascapes – really appreciate it! Thank you so much for your generous comment, I really appreciate it! Thank you Iris, I really appreciate your thoughtful comment! Your seascapes are absolutely stunning – really impressive! Thanks Noora for your lovely comment – nice to meet you!! Glowing skies and living seas – simply beautiful. I cannot paint or draw with any competence, but love to see such craftsmanship and skill put to such an elegant and absorbing purpose. Thank you so much Pat for your beautiful comment, really appreciate hearing from you and thank you for stopping by. Hi Nina, thank you for your lovely and generous comment – it’s really appreciated! Unfortunately I’ve found many images of my work all over the internet some w/credit some without, but none asked, so I’ve turned most shares like facebook and pinterest off and have turned off the ability to reblog. You are a fabulous writer, but at this point I’d rather not have my work shared on your blog, just because once it’s posted on your blog I have no control over where it goes from there. I hope it makes sense and you’ll understand I’ve been burnt really bad. Thank you Nina for your nice comment – it’s been a real fight for me. But enough of that – I’m looking forward to seeing your writings. Have a wonderful week too! Your brilliant “nature-energy” and sensitivity to your environment is quite evident in each of your lovely paintings, Mary! Thank you very much for your generous comment – means a lot and is really appreciated. I love painting the ocean, has it’s own song of sorts. All of those seascapes are just beautiful! Thank you so much Jill for your wonderful compliment – really appreciated! Thanks very much Bette – much appreciated! Hi, Mary. Thank you for liking The Green Acre. I love your seascapes. Hi Patricia, thank you so much for your nice comment – friend of the sea (love your blog header). Glad you enjoy my seascapes. Love your blog and reading your history, so interesting and comments under “about you”, very refreshing from our world today. Thank you very much for your lovely comments and for visiting my blog. Very nice to meet you! Dear Mary, Your seascapes are truly inspiring. made my day! Thanks you for your lovely and heartfelt comment! Seascapes are my favorite, and yours are spectacular as well as magical. You are a tremendously talented artist. Thank you for these beautiful creations and for sharing them with us. Thank you very much for your beautiful and generous comment, means a lot. Thanks for visiting my blog and now following. Barry I should thank you for such generous and wonderful comments – they are really appreciated. Thank you very much! Thanks you so much for your lovely comment! Wow! Beautiful work, I love your seascapes! Thank you so much for your generous comment – I really appreciate it. Thanks for stopping by and now following! I also paint seascapes! Yours are awesome! Thank you Sergey for your wonderful words, they are very meaningful. I’ve been to your blog and really enjoy your paintings, there is much passion to your works of art! As one who lives on the coast I really like your seascapes. May have to follow to enjoy more of your work! Thanks for dropping by my site – I have enjoyed looking at your work. I used oil pastels myself quite a few years back but didn’t stay with them.. I enjoyed both your landscapes and your seascapes. I thought the seascapes were very well done. I look forward to seeing more. Thank you so much for visiting my blog and now following. 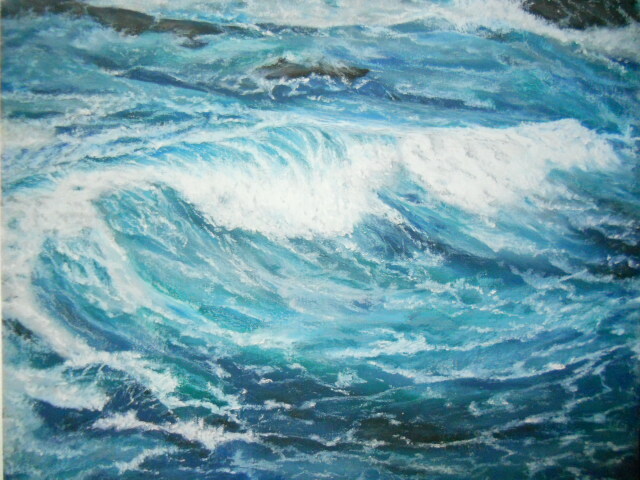 I appreciate your comment – I love painting seascapes, oil pastels makes the scenes come alive. Incredible how you have capture the waves splashing into the rocks. Wish you much success! Hi Patricia: Thank you so much! My favorite subject is the sea. I just love using oil pastels to paint rocks the OPs gives great texture with beautiful colors emerging as I blend. It is my pleasure! Your beach paintings transports me to there. I can almost hear the water! Just beautiful! Thank you so much, I really appreciate your feedback. The sea has a strong and powerful pull/appeal for me. A beauty unmatched – thank you for your kind words!!! Thank you for commenting and following, it’s much appreciated!